Shimoda is jam-packed with restaurants, cafes, and bars which can make it really difficult to choose. Well at least that is what happened to me a few years past when I really wanted to try some good local seafood. Eventually I turned to my trusty lonely planet which read, “Gorosaya. Elegant understated ambience and fantastic seafood”. I can’t agree with the ambience part. It is understated but not exactly elegant. I do love to sit at the counter and watch the master chefs do their work (and hopefully learn some of their secrets). The food is probably better than fantastic, and the price is also incredibly reasonable if not down-right cheap. Gorosaya has an amazingly long history as well. This place has been operating under the same name by the same family for the last 200 years, and if you try it you will see why they have been in business for so long. Gorosaya has an English menu that is not as comprehensive as the Japanese menu but I highly recommend getting a set meal (teishyoku)for 1700 yen. They have several different teishyoku to choose from. Take your pick: Yakizakana (grilled fish) , the Nizakana (boiled fish), Tempura (deep-fried goodness), or Sashimi (raw fish) teishyoku. There is also one slightly more expensive option (2100 yen) which is a mix of the sashimi and the boiled fish (Kin-me-dai & Sashimi Teishoku) set. I usually go with the boiled fish or the raw fish or get the mixed set. 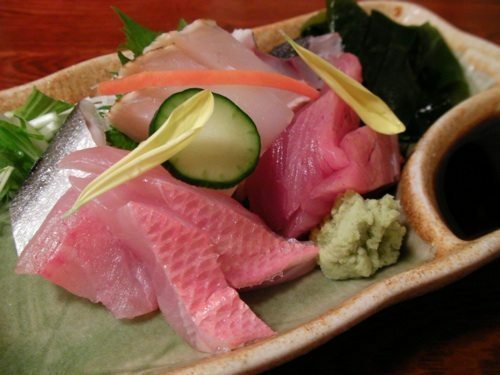 The sashimi is an amazing mix of the sea’s freshest delicacies. 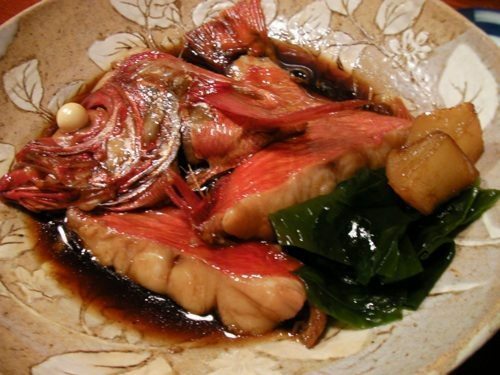 The boiled fish is usually kin-me-dai (a golden-eyed red snapper) cooked to absolute perfection. All set meals come with rice, pickels, chawanmushi (a savoury pudding), miso soup, a seaweed dish, and a citrus jelly or fresh fruit for dessert. Do go there hungry. The portions are huge!